Since 2008, Dr. Mark Post has been working on growing edible meat in a laboratory. 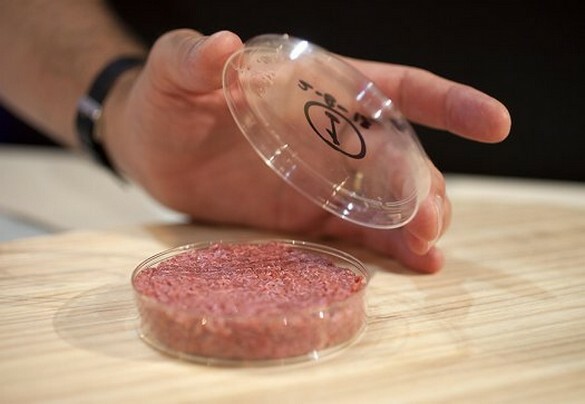 Today, at an event in London, the first in-vitro hamburger has been served. Muscle stem cells were taken from a cow's shoulder in a gentle biopsy and grown in serum, with micro-exercise so they wouldn't be flabby. 20,000 cells were then assembled into a burger, bound with bread crumbs and egg (but curiously no salt), colored with beet juice and saffron, and presented to the public. The event was also broadcast on Culturedbeef.net. Dr. Post, a cardiovascular biologist from Maastricht University, brought his raw burger out, in a petri dish under a cloche. On a television set, chef Richard McGeown, opining that it looked a little paler than normal, cooked it in butter and oil before a hungry audience, then served it to two lucky volunteers: Austrian food futurist Hanni Rützler, and Josh Schonwald, author of The Taste of Tomorrow. Hanni: "There is quite some intense taste. It is close to meat; it is not that juicy. I missed salt and pepper. More than I expected of the the structure, it's not falling apart." Josh: "The texture, the mouthfeel, has a feel like meat. The absence is the fat. It's a leanness. But the bite feels like a conventional hamburger." The technology to grow fat cells is still lacking -- Schonfeld characterized the texture as like "an animal protein cake" -- but that is the next step for the team. "I think it's a very good start," said Dr. Post. "This was mostly to prove that we can make it." The following challenge will be to scale up the process. Dr. Post currently estimates that it will take 10 to 20 years before cultured meat can be mass-produced. For the last few years, the project has been funded by an anonymous benefactor who, Dr. Post revealed today, is Sergey Brin. Dr. Post answered some other questions from the audience. Can you make a steak? In theory. "We are currently focusing on minced meat products, using shorter fibers, because there is a limitation on the diffusion distance of oxygen and nutrients into the center of the tissue." Can they use this technology to make burgers from less common animals? Penguins? "I don't like the smell of penguins, but I guess we can. You can do it with any sort of satellite cell from an animal." The leftovers were taken home for Dr. Post's children.